Sometimes I have to find out more about a domain and its owner or company. This is for instance part of my research when I'm evaluating websites and also helpful to identify the owner of a website that is scraping my articles without attribution or permission. Some of the information that I look-up as part of the research are the whois information and DNS records of the website in question. DomainHostingView is a new Nirsoft application that seems to have been designed specifically for that purpose. The portable software looks-up information about a domain or website. All the user needs to do is to enter a domain name in the form at the top of the application to generate a domain report for the domain. It takes a few seconds to generate the report before it appears in the interface. The report begins with a summary at the top listing the important bits of information at the top. This includes the domain registrar and company or individual it is registered to, the web hosting company, mail server and information about the domain creation, update and expiration dates. The program seems to have problems identifying some information from subdomains (like www.ghacks.net) correctly. DNS Records, IP Addresses Information, Raw Domain Information, Web Server IP Address Information, Mail Server IP Address Information and Name Server IP Address Information follow after the summary. All the information on the screen can be highlighted, copied and pasted easily. There is also the option to generate an HTML report of the current domain report. Reports can be saved locally for future reference. The program is missing a few elements that other Nirsoft applications offer. This includes exporting the data to a txt or XML file, or printing a selection or all of the information. It is likely that at least part of the missing features will make their way into future versions of the application. 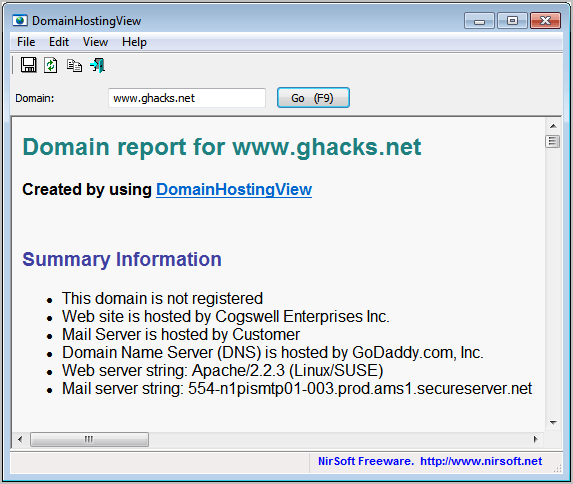 DomainHostingView is a portable program for 32-bit and 64-bit editions of the Windows operating system. The program is available for download at the Nirsoft website.